Perigrinatie oste Veertigh-Iarige Reyse der Kinderen Israels, Uyt Egypten door de Roode Zee endede Woestyne tot in't Beloof de Lande Canaan. An absolutely stunning c. 1687 map of the Holy Land, Israel, or Palestine by N. Visscher and Jan van den Avelen. This map, from a Dutch Bible, is oriented to west and covers from the Nile Delta, Cairo and Memphis, egypt, across the Red Sea and along the Mediterranean Coast as far north as Sidon and Tyre (Lebanon), and further inland, Palmyra. 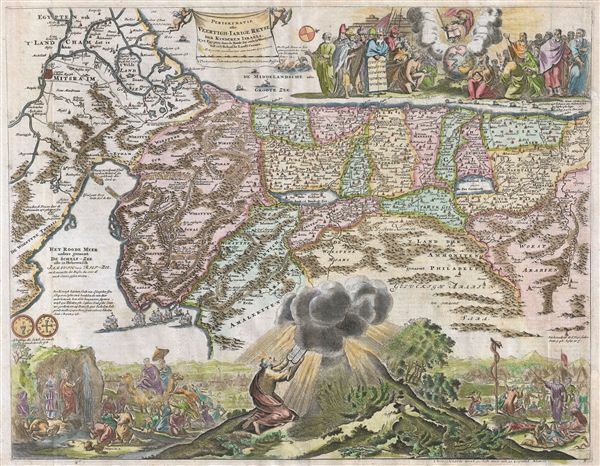 Cartographically this map hails from the Nicholas Visscher map of 1650, but it does exhibit some modifications including completely revised topical imagery in the lower quadrants and additional decorative work in the upper right quadrant. Like Visscher's map, our map shows the course of the Israelites as they fled out of egypt, across the Red Sea, and subsequently spent the next forty years wandering in the Sinai before migrating into the Promised Land by crossing the Jordan River just north of the Dead Sea. Mt. Sinai, Mt. Horeb, Sodom, Gomorra, Jerusalem, and countless other importable Biblical locals are noted. In the Mediterranean a fleet of ships is transporting cedar from Sidon to Jaffa for the construction of Solomon's Temple. Also in the Mediterranean, there is an illustration Jonah being swallowed by the whale. These are the only two decorative elements that are inherited directly from Visscher's map of 1650. The elaborate decorative engraving work lower quadrants and in the upper right is the work of Jan van den Avelen, a Dutch engraver active in Amsterdam during the late 17th century. Van den Avelen elaborate illustrations depicts various scenes from exodus including Moses receiving the Tables of Law, the encampments of the Israelites, Moses producing water from a stone, etc. A truly beautiful map and one of the finest maps to appear in a 17th century Bible. Jan van den Aveelen (1655- May 18, 1727), also called Aveele, was a Dutch sketch artist and engraver active in the late 17th and early 18th centuries. Aveelen was born in Leiden or Amsterdam around 1655. He is known to have worked as an engraver in Utrecht, Leiden, and Amsterdam with various Dutch publishers including Nicholas Visscher. In 1698 Visscher recommended Aveelen to quarter-master general of Sweden Erik Dahlbergh, who hired him to replace the deceased Willem Swiddle, another of Visscher's prodigies. Relocating to Sweden, Aveelen worked on the completing the engravings for Suecia Antiqua et Hodierna, his most significant collection of work. Aveelen died in Stockholm Sweden on May 18, 1727. Very good. Even overall toning. A few minor verso repairs. Dutch text on verso.